This tutorial provides steps for using the Azure portal to provision an Azure-SSIS integration runtime (IR) in Azure Data Factory. 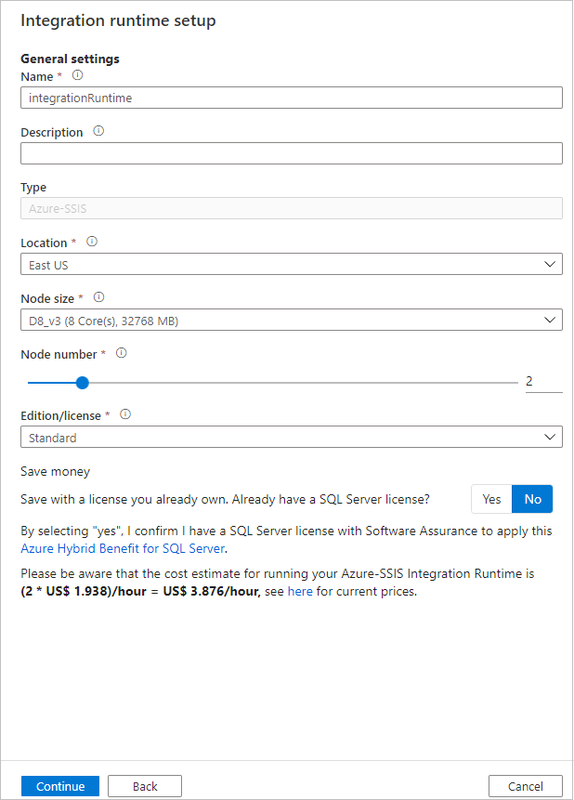 Then, you can use SQL Server Data Tools (SSDT) or SQL Server Management Studio (SSMS) to deploy and run SQL Server Integration Services (SSIS) packages in this runtime in Azure. For conceptual information on Azure-SSIS IRs, see Azure-SSIS integration runtime overview. Provision an Azure-SSIS integration runtime. Azure subscription. If you don't have an Azure subscription, create a free account before you begin. Azure SQL Database server. If you don't already have a database server, create one in the Azure portal before you get started. Azure Data Factory creates the SSIS Catalog (SSISDB database) on this database server. We recommend that you create the database server in the same Azure region as the integration runtime. This configuration lets the integration runtime write execution logs to the SSISDB database without crossing Azure regions. Based on the selected database server, SSISDB can be created on your behalf as a single database, part of an elastic pool, or in a Managed Instance and accessible in public network or by joining a virtual network. If you use Azure SQL Database with virtual network service endpoints/Managed Instance to host SSISDB or require access to on-premises data, you need to join your Azure-SSIS IR to a virtual network, see Create Azure-SSIS IR in a virtual network. Confirm that the Allow access to Azure services setting is enabled for the database server. This is not applicable when you use Azure SQL Database with virtual network service endpoints/Managed Instance to host SSISDB. For more information, see Secure your Azure SQL database. To enable this setting by using PowerShell, see New-AzSqlServerFirewallRule. Add the IP address of the client machine, or a range of IP addresses that includes the IP address of client machine, to the client IP address list in the firewall settings for the database server. For more information, see Azure SQL Database server-level and database-level firewall rules. 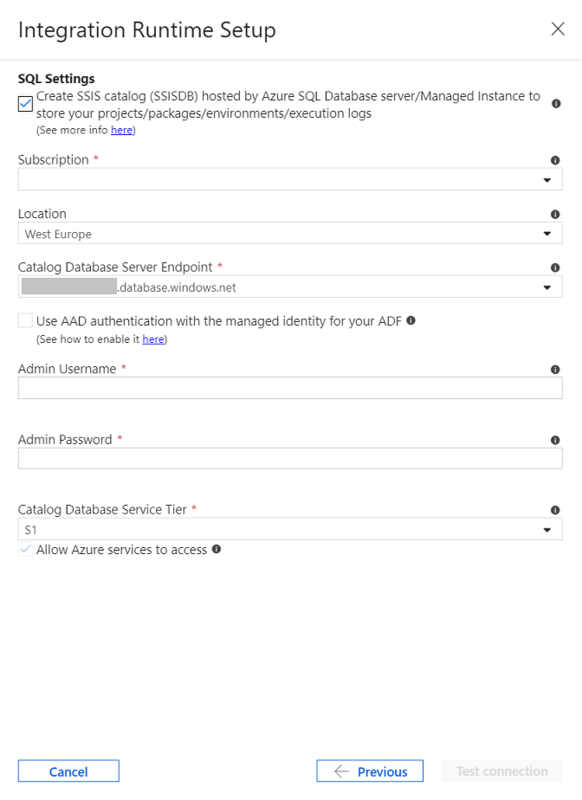 You can connect to the database server using SQL authentication with your server admin credentials or Azure Active Directory (AAD) authentication with the managed identity for your Azure Data Factory (ADF). For the latter, you need to add the managed identity for your ADF into an AAD group with access permissions to the database server, see Create Azure-SSIS IR with AAD authentication. Confirm that your Azure SQL Database server does not have an SSIS Catalog (SSISDB database). The provisioning of an Azure-SSIS IR does not support using an existing SSIS Catalog. For a list of Azure regions in which Data Factory and Azure-SSIS Integration Runtime are currently available, see ADF + SSIS IR availability by region. Select New on the left menu, select Data + Analytics, and then select Data Factory. 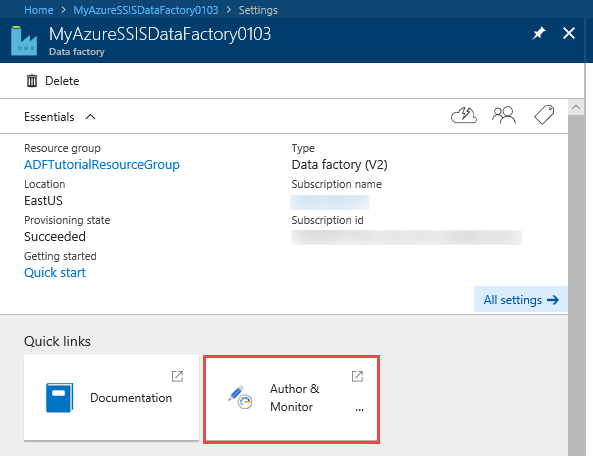 On the New data factory page, enter MyAzureSsisDataFactory under Name. The name of the Azure data factory must be globally unique. If you receive the following error, change the name of the data factory (for example, <yourname>MyAzureSsisDataFactory) and try creating again. For naming rules for Data Factory artifacts, see the Data Factory - naming rules article. For Version, select V2 (Preview). For Location, select the location for the data factory. The list shows only locations that are supported for the creation of data factories. After the creation is complete, you see the Data factory page. Select Author & Monitor to open the Data Factory user interface (UI) on a separate tab. 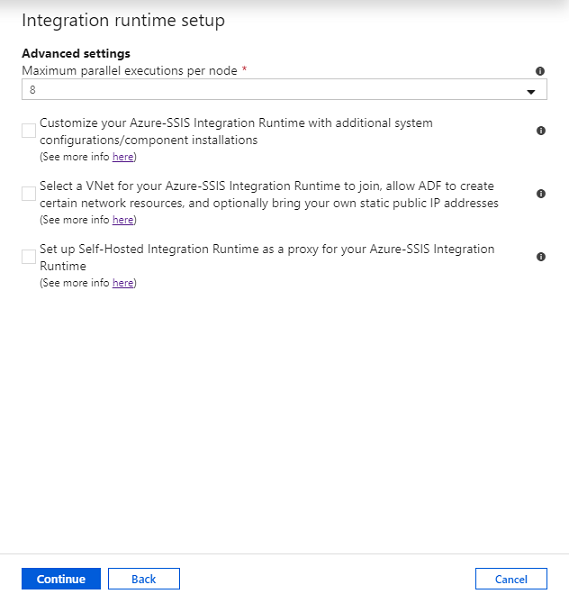 On the Let's get started page, select the Configure SSIS Integration Runtime tile. 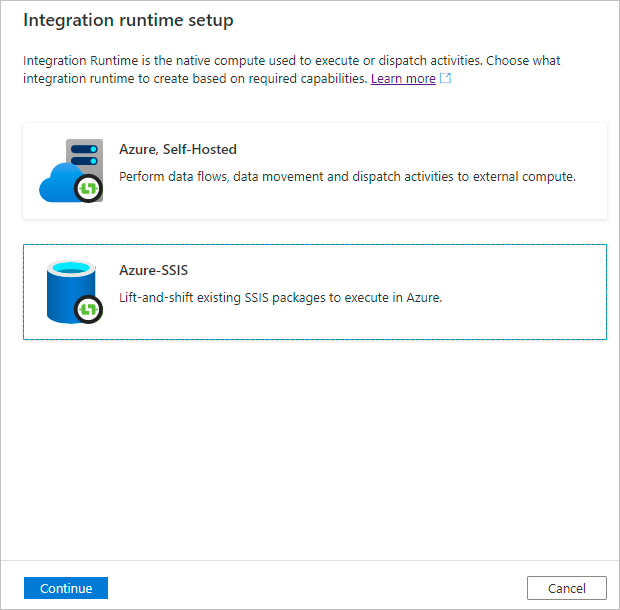 For the remaining steps to set up an Azure-SSIS IR, see the Provision an Azure-SSIS integration runtime section. In the Azure Data Factory UI, switch to the Edit tab, select Connections, and then switch to the Integration Runtimes tab to view existing integration runtimes in your data factory. 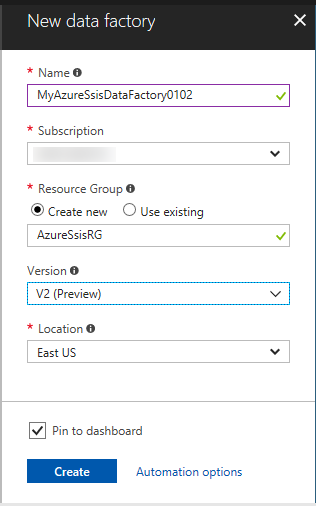 Select New to create an Azure-SSIS IR. In the Integration Runtime Setup window, select Lift-and-shift existing SSIS packages to execute in Azure, and then select Next. c. For Catalog Database Server Endpoint, select the endpoint of your database server to host SSISDB. Based on the selected database server, SSISDB can be created on your behalf as a single database, part of an elastic pool, or in a Managed Instance and accessible in public network or by joining a virtual network. For guidance in choosing the type of database server to host SSISDB, see Compare Azure SQL Database single databases/elastic pools and Managed Instance. If you select Azure SQL Database with virtual network service endpoints/Managed Instance to host SSISDB or require access to on-premises data, you need to join your Azure-SSIS IR to a virtual network. See Create Azure-SSIS IR in a virtual network. d. On Use AAD authentication... checkbox, select the authentication method for your database server to host SSISDB: SQL or Azure Active Directory (AAD) with the managed identity for your Azure Data Factory (ADF). If you check it, you need to add the managed identity for your ADF into an AAD group with access permissions to the database server, see Create Azure-SSIS IR with AAD authentication. a. For Maximum Parallel Executions Per Node, select the maximum number of packages to execute concurrently per node in your integration runtime cluster. Only supported package numbers are displayed. Select a low number, if you want to use more than one cores to run a single large/heavy-weight package that is compute/memory -intensive. Select a high number, if you want to run one or more small/light-weight packages in a single core. c. On Select a VNet... checkbox, select whether you want to join your integration runtime to a virtual network. You should check it if you use Azure SQL Database with virtual network service endpoints/Managed Instance to host SSISDB or require access to on-premises data, see Create Azure-SSIS IR in a virtual network. Click Finish to start the creation of your integration runtime. This process takes approximately 20 to 30 minutes to complete. 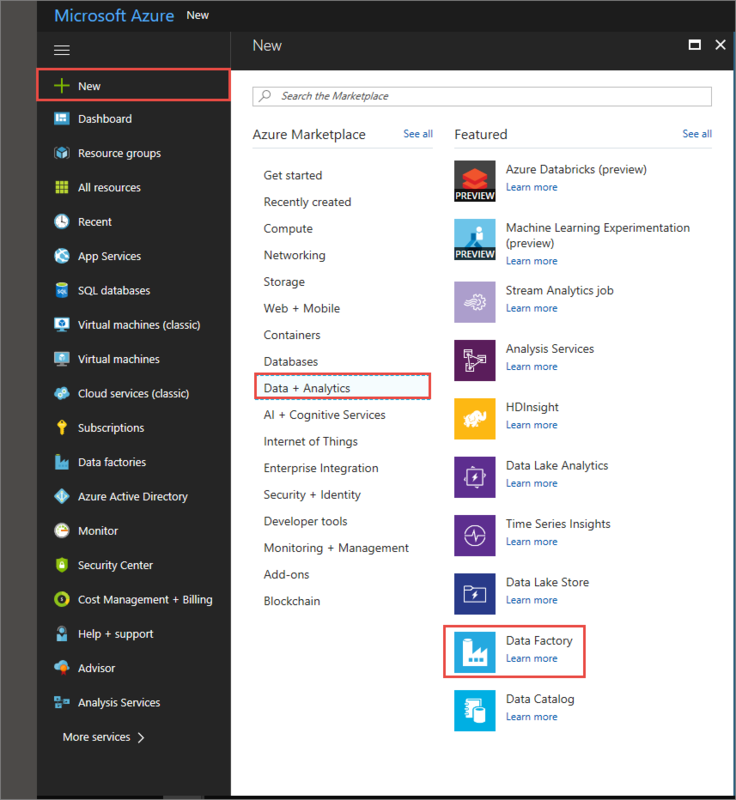 The Data Factory service connects to your Azure SQL Database server to prepare the SSIS Catalog (SSISDB database). When you provision an instance of an Azure-SSIS IR, the Azure Feature Pack for SSIS and the Access Redistributable are also installed. These components provide connectivity to Excel and Access files and to various Azure data sources, in addition to the data sources supported by the built-in components. You can also install additional components. For more info, see Custom setup for the Azure-SSIS integration runtime. On the Connections tab, switch to Integration Runtimes if needed. Select Refresh to refresh the status. Use the links in the Actions column to stop/start, edit, or delete the integration runtime. Use the last link to view JSON code for the integration runtime. The edit and delete buttons are enabled only when the IR is stopped. Now, use SQL Server Data Tools (SSDT) or SQL Server Management Studio (SSMS) to deploy your SSIS packages to Azure. Connect to your Azure SQL Database server that hosts the SSIS Catalog (SSISDB database). The name of Azure SQL Database server is in the format <servername>.database.windows.net.